The second part of Peter Taylor's three part series investigates the bomb attacks on Madrid last year and what they reveal about the new al-Qaeda which has evolved since 9/11 and the US-led military action in Afghanistan. A new breed of Islamic extremist which blends into Western culture is portrayed in the programme entitled the Drug Dealer, the Estate Agent and the Telephone Man. The Madrid train bombings of 11 March last year killed 191 people - one of the most devastating terrorist attacks ever carried out in Europe. It was the bloody calling card of the new al-Qaeda, a loose network of jihadi groups, locally recruited and acting independently of Osama Bin Laden. A British Intelligence source points out: "The point is not that Madrid was al-Qaeda as we know it, but that it wasn't." What makes the new al-Qaeda different is the recruitment of criminals and drug dealers into its cells. Many are known as Takfiris who adopt Western dress and lifestyle as cover for their terrorist activities. The Madrid cell got away with its attack because Spain's intelligence agencies missed a series of blatant clues and failed to realise that al-Qaeda had changed. They also failed to make vital connections between the Madrid attack and the Casablanca suicide bombings the previous year. 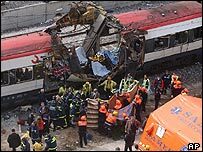 In the most thorough investigation yet into the Madrid train bombings, reporter Peter Taylor pieces together the new al-Qaeda jigsaw and unravels the history of the key members of the Madrid cell: the Drug Dealer, the Estate Agent and the Telephone Man. The film opens with a reconstruction of the Spanish police blowing the door off a flat in a Madrid suburb. Inside, seven North African terrorists are preparing themselves for martyrdom. They were part of a cell responsible for killing nearly 200 people in the Madrid train bombings last year. They had ritually shaved, drunk holy water from Mecca and put on white robes of martyrdom. Then they blew themselves up in front of the world's press. The profiles of the men could not be further from the classic image of an international terrorist. But that is what made them so dangerous. They looked ordinary. For the first time, all the key figures hunting both the Madrid bombers and those behind the Casablanca bombings the year before have agreed to talk to one journalist, Peter Taylor. The programme has also been given access to crucial intelligence reports and had private briefings with the UK's security services. And it reveals chilling parallels to the London attacks, showing that al-Qaeda never went away, but simply shut down its head office. Local branches have opened up in its place and act autonomously, which means they are much more difficult to identify, infiltrate and catch. The picture painted by this unprecedented array of sources shows just how far international terrorism has altered since 9/11 - and how those hunting the terrorists must change with it. 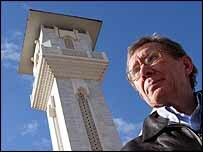 The New Al-Qaeda: the Drug Dealer, the Estate Agent and the Telephone Man was shown on Monday 1 August 2005 at 2100BST on BBC Two.